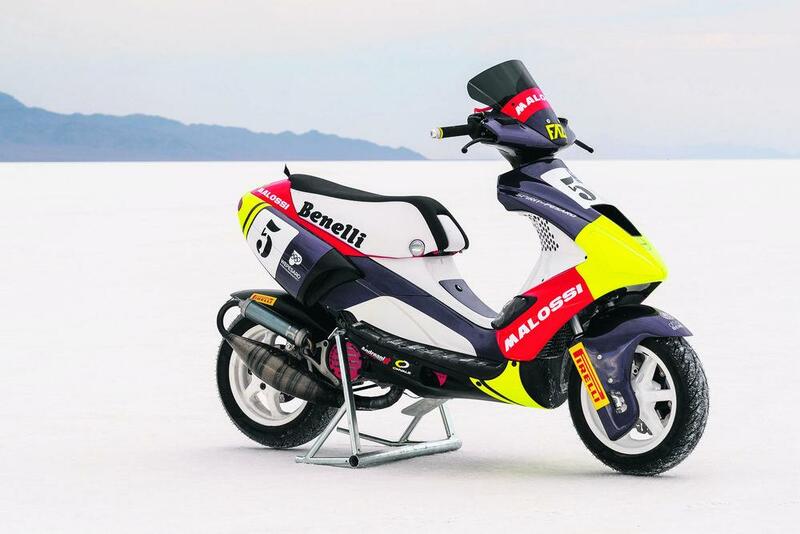 Pirelli teamed up with Moto Club Benelli and Malossi at Bonneville Speed Week last month to set not one, but six scooter top speed records on three models of the Benelli 491. The 50cc Benelli managed to set a top speed of 71mph over both the kilometre and mile courses. Pretty impressive when you consider most 50cc scooters will spend there life stuck at 30mph. Maybe they'll reach an indicated 40mph down a steep hill. The 85cc Benelli scooter managed to set speeds of 82.64 and 82.43mph, while the 100cc scoot exceeded 88mph on both runs. The engines in all three machines were tuned by Jörg Möller. Project engineer Fabio Fazi set the first two records, while the remaining four were set by former World and Italian Superbike rider Mauro Sanchini, who started his career racing scooters for Malossi in the 1990s.